Cyclists in the City: Last year not a single person was killed riding a bike in Paris. In London there were 16. Boris Johnson is spending a fortune but something is going very wrong. Where on earth is he spending all that money? 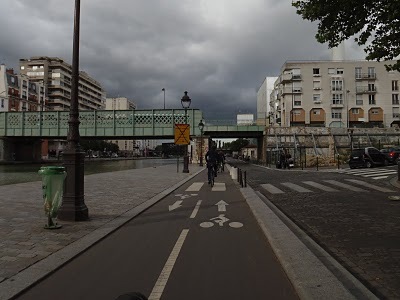 Last year not a single person was killed riding a bike in Paris. In London there were 16. Boris Johnson is spending a fortune but something is going very wrong. Where on earth is he spending all that money? I'm going to let the poster do most of the talking. The Times today points out that Copenhagen has spent £77million over the last decade on cycling. This is a city where the majority of school children feel safe enough to cycle to school. 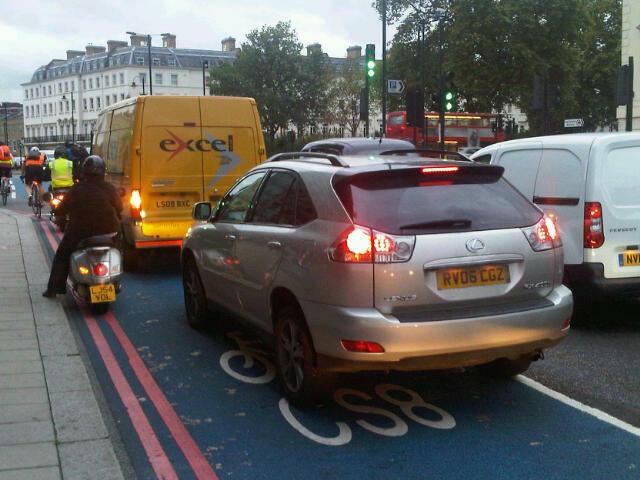 By contrast, London's Mayor is extremely proud of spending £2million per mile on London's cycle super highways. As I pointed out last month, that is at least 10 times more per mile than the properly segregated bike lanes in Chicago. Boris has spent more on Cycle Super Highways in four years than Copenhagen in 10. I suggest that Copenhagen has had much better return on its investment than our Mayor has achieved in London. What the hell has he spent all the money on? Blue paint doesn't cost that much. What's more, the blue paint doesn't seem to be working. Boris's £2million per mile cycle super highways. Impressive, huh? Last year, 16 people were killed in London on their bikes. In Paris, that number was zero. Yes, no-one was killed cycling on a bike in Paris last year. "It is simply not possible to put in a dedicated lane that would protect a cyclist in the way that we would all want without totally disrupting the traffic….."
What the Mayor forgets is that people are traffic, whether they're on bikes or in cars. Or on foot, frankly. That's why at Bow roundabout - a place where several pedestrians and cyclists have been killed in the last two years - he won't install pedestrian crossings. Why on earth not? It might interrupt the 'traffic', he implies. "In some places you can put in separation. Most of our roads are wide enough to do that"
I'm not quite sure if I believe Livingstone yet, to be honest. Here's what he had to say about bike lanes last summer: "In a perfect world, we would have hundreds of miles of segregated cycle routes, but we have to face the reality that this is very difficult on many of London’s roads.” So which one is it Mr Livingstone? The new message or the old one? Meanwhile, over in Paris? They're building a 700km network of bike lanes that look like this. Right through the middle of the city and spanning in all directions. It makes Boris's blue paint look like the wrong strategy. And a very expensive strategy at that. I don't think that's good enough. If you're going to spend hundreds of millions, do it properly and don't just give us blue paint. If you haven't done so yet, sign up to The Times cyclesafe campaign. And in particular copy their manifesto and click the link to send it to your MP. I've finally got around to looking at the times campaign, and though I'll sign up I'm struck by how incredibly weak the 8 points seem. There are certainly aspects of the 8 point plan which I am ambivalent about - some of the stuff does sound a bit woolly but proper statistical analysis and engineering reviews are actually essential in order to know what needs to be put right and how £100m can best be spent. They certainly aren't suggesting it is spent on mirrors! Some of those who have supported the campaign will no doubt be highly selective and just plug the training/education bit and ignore the big-spending bit and any other bits they find inconvenient - certainly I wonder about Boris' apparent "support" for this. He has always focused his attention on attitudes, awareness, training, HGV mirors etc, in other words all things which are outside his remit as Mayor so he can safely pontificate about them knowing that nothing he does makes any difference anyway. What he certainly can do is spend 2% of the TfL budget on cycle infrastructure, and that would be a huge multiplication of what is spent now - I'll bet rather less than 0.5% at the moment, even with the cost of the superhighways. If not, he isn't spending the money well. You have perhaps seen those embroidered samplers people have on the wall - the Serenity Prayer: "Lord, give me the serenity to accept the things I cannot change, the courage to change the things I can, and the wisdom to know the difference". Boris should put this on his office wall, and start exercising some courage, and some wisdom. Another potential source of revenue for cycling infrastructure are the fees and charges that property developers as part of new developments. Until recently these were all handled under section 106 of the town and country planning act and were supposed to be limited to 'impact fees'. Now we've got something called the community infrastructure levy which involves collecting standard fees from every development. In both cases much of the money has usually gone to transport, but from my experience in London this has usually been earmarked for road 'improvements', bus stops and the like and has not been used for putting in cycling infrastructure to cater for new or existing demand. So we should argue that cycling should get a significant chunk of CIL revenues in future. The Times manifesto isn't that lame. The one point is "The training of cyclists and drivers must improve and cycle safety should become a core part of the driving test." I’ve just started the CS routes in the last few weeks. It’s not as big a fail as I had expected in that I thought drivers used them at will. That was until I did a rush hour sessions to get to work. I still feel the concept of the cycle lane a little woolly. I try and avoid letting frustration overcome me as it only turns into anger at the world at large so try and remain passive to it but my issue still revolves around protection of the cyclist. Helmets strike me as a method to protect cycles from being run over but I still find the argument poor to suggest a polystyrene hat will save your life against a large truck turning left. I still find this security a false dawn and promoted by those that don’t know better. What we currently have is a blue lane of around 1-5 meters wide if there at all. We have ASLs for cyclist to position themselves in full view of traffic with friendly small cycle lanes at junctions bizarrely encouraging people to undertake vehicles such as buses normally in the one single place we shouldn’t be. I’d actually like these removed to ensure cyclist move to the right of traffic to overtake and pull into the ASL boxes. That would however require the space and often that is taken up by the motorist. My first law would be to enforce against the motorist that breach the ASL is an offence. As I understand it, fines can be issues for stopping in a junction gridded zone and can be carried out by CCTV/Police camera, so I see no reason why this cannot be applied to a motorist ASL breach. I’d also bring in the same technology for the Cycle Superhighways where solid white lines are drawn and are illegal to cross. I think when the message starts getting through that this is an illegal move for a motorised vehicle then it would start the 2nd thought mentality and force people to shift their thinking. I’d even move this into a points fine. A repeat fine can be moved to penalty points for repeatedly not observing highway conditions. In short, I’d like drivers to be forced to think that using a cycle lane is at least as equal to as dangerous as driving on a pavement. We have nothing as close to as sound setup to mainland Europe then we have to start forcing something to give and break mentality like the drink drive campaigns finally took effect and has become a social taboo. Also, I remember Jackie Stuart talking about F1 safety for years, and still does quite openly and methodically. I’m a keen fan of his as an avid F1 fan, but I remember his breakthrough as such wasn’t from what he was saying as such but the lack of desire from team sponsors having their names branded to burning cars and melting flesh. Cynically, when a famous cyclist takes a fatal fall on a heavily branded area of a Cycle Superhighway then we may see some real progress. As real money is coming into the business, so will the volume of its voice.